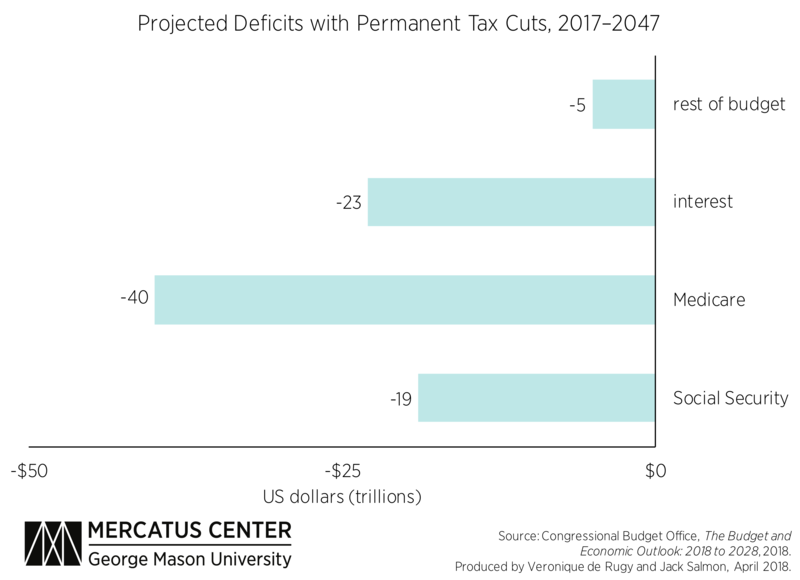 The Congressional Budget Office (CBO), in its recently released Budget and Economic Outlook: 2018 to 2028, revised upward its federal deficit projections for the next 10 years: instead of reaching 5 percent of GDP by 2027, the deficit is now projected to reach 5.4 percent of GDP by 2022. The increase is the result of a continued explosion in mandatory spending and interest payments and of short-term declines in revenues proceeding from the recent tax cuts. 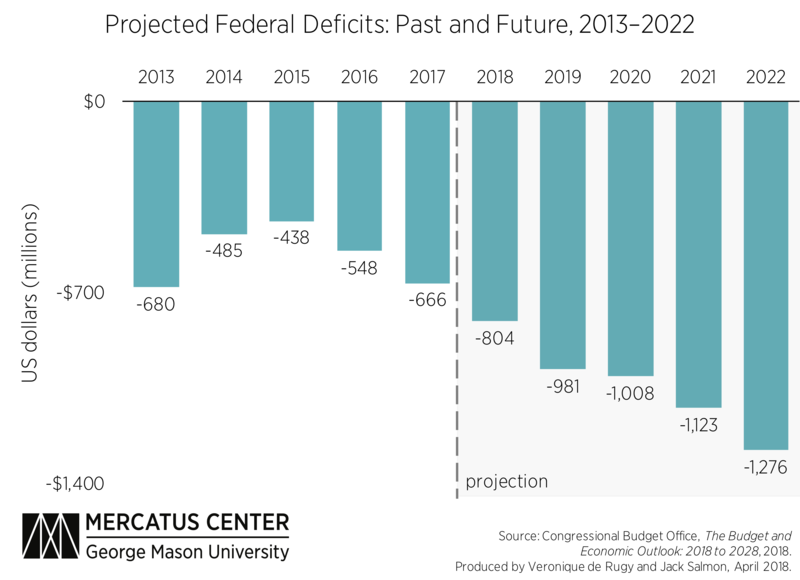 These latest projections also show how much larger the deficit and debt will be in the coming years than what the CBO had previously estimated in 2017. Federal outlays, which have historically hovered around 20 percent of GDP, are projected to exceed 23 percent of GDP by 2028. 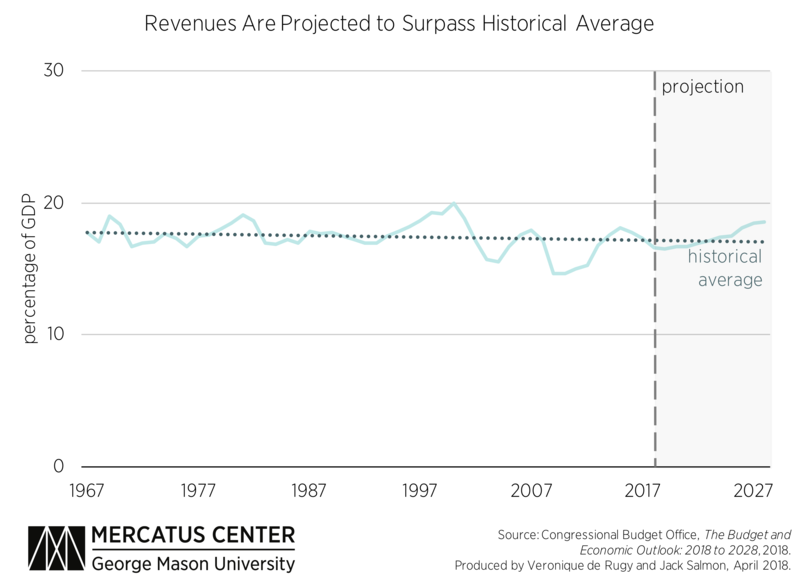 Revenues as a share of GDP will fall slightly following the 2017 tax cuts, then recover to their historical average by 2025 and exceed historical averages thereafter. 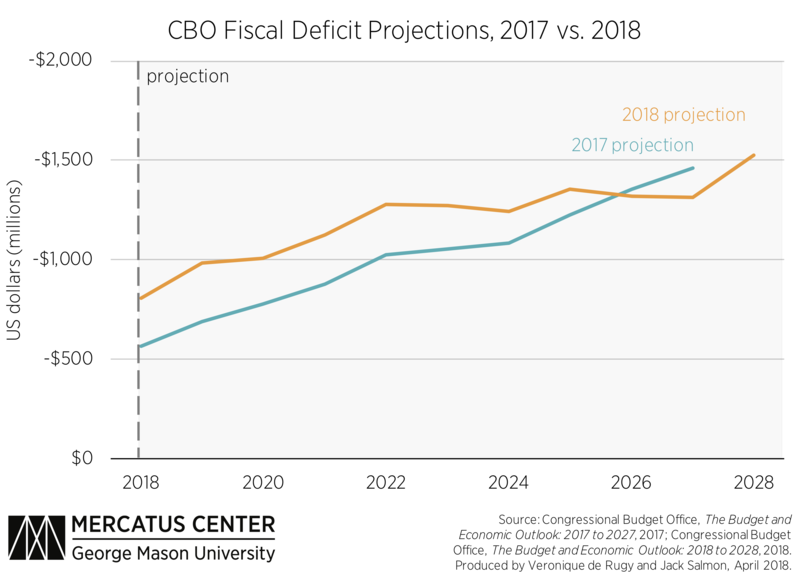 With current levels of mandatory spending and promises of future spending increases, these CBO projections convey one very simple message: deficits are now the norm, and the level of federal debt held by the public will continue to mount as the interest on that debt eats up ever-larger amounts of the federal budget. On current trends, the level of debt held by the public is set to be about $15.7 trillion by the end of 2018, and it will continue to rise to $28.7 trillion by 2028. 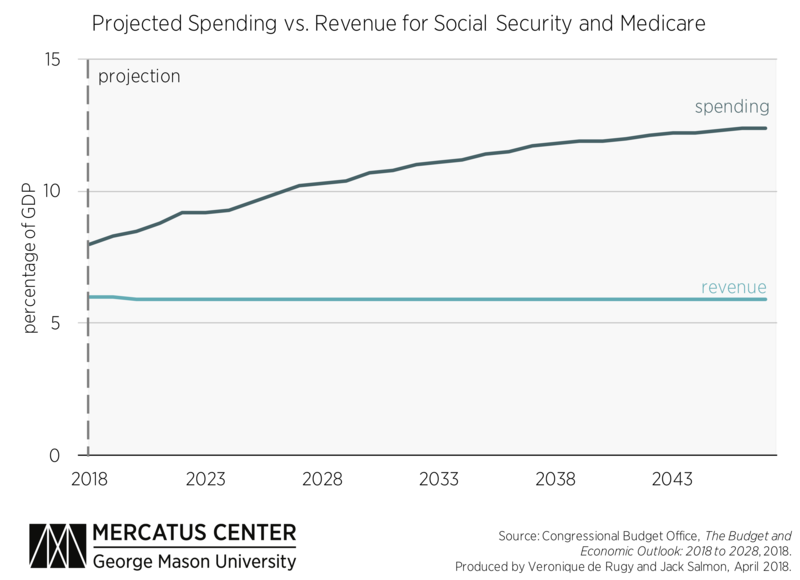 Looking at the long-term outlook, between 2017 and 2047 the combined deficit resulting from Social Security, Medicare, and interest payments will total $82 trillion. 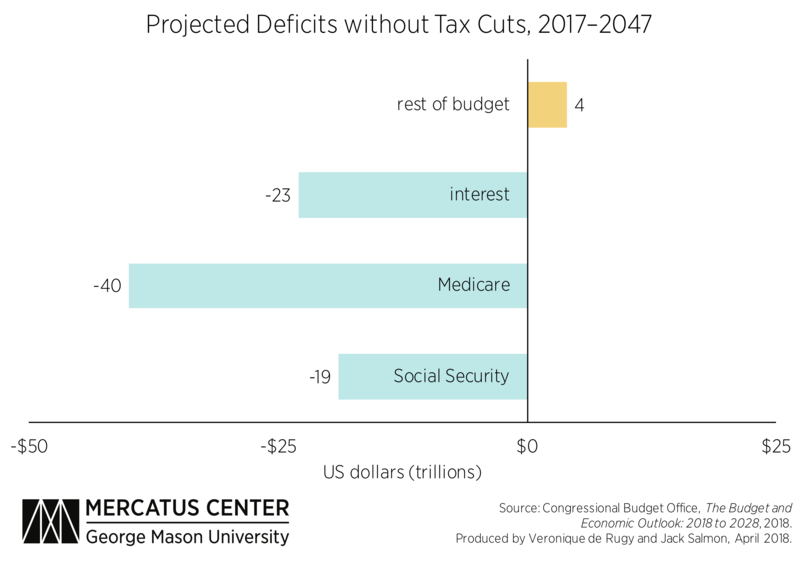 The expanding outlays of Social Security and Medicare play a key role in the increase in budget deficits. The late 2017 tax cuts do not negate this broad narrative. More debt means lower economic growth and ultimately slower growth in employment opportunities for future generations. That’s because the debt has a negative impact on private-sector investment, productivity and wages, and interest rates. US debt is growing and it’s growing fast. 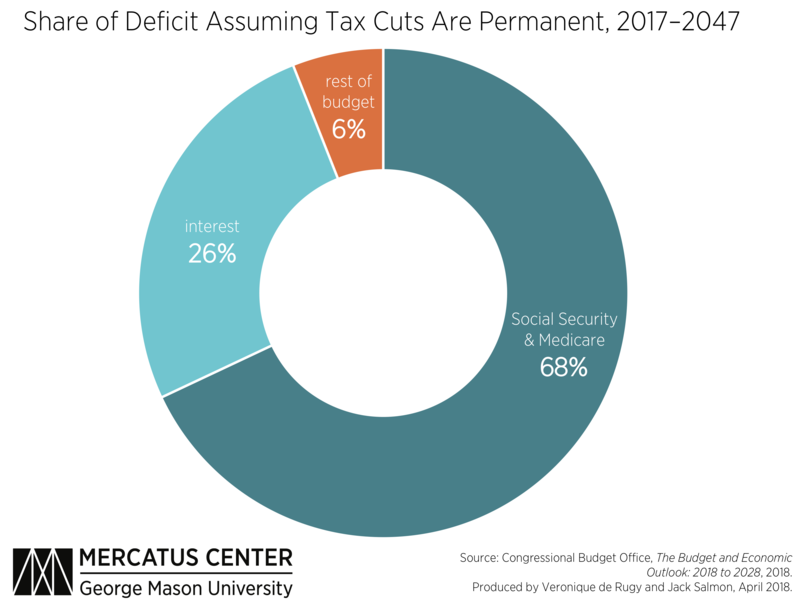 But while it is a shame that lawmakers passed tax cuts without cutting spending to offset short-term losses in revenue, there is no doubt that Social Security and Medicare deficits are major drivers in the debt crisis to come.